Sniper Elite: Nazi Zombie Army is available for download right freak'n now. 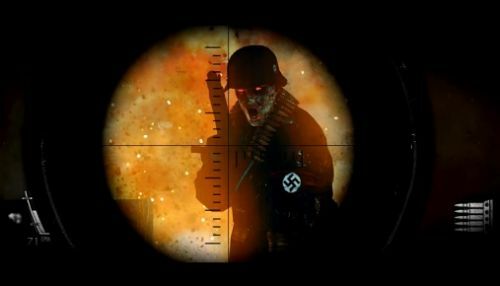 If you like sniping and you hate zombies, especially Nazi zombies who have been organized into some kind of fighting force --let's call it an army, a "Nazi Zombie Army," if you will-- then this is the game for you. Now I have no idea where Hitler is getting all these zombies. I'm pretty sure I blew the head off of every Nazi soldier on the western front in my initial playthrough of Sniper Elite V2. He must get these guys wholesale. We've got a fancy new launch trailer to get you in the zombie hunting mood. I know zombies aren't the most novel idea, but SE:NZA is set during World War 2! Wait, that's not very original either... You have to shoot them in the head to kill them, but judging from the video a good old fashioned body shot will work too... so that's new? Whatever. There's four player online co-op. Go snipe some damn Nazi zombies and save the world. SE: V2 was a quality sniping title. I'm hoping SE:NZA will have the same bloody charm. Jason and I had a swell time with V2's two player co-op campaign, so if my math is right, SE: NZA's four player cooperative campaign will be 40 times as fun (two players x2, and then x10, because of mother-fuehrering zombies). The only thing that worries me is there seems to be an abundance of up close and personal gun play, and not as much sniping. We'll see how it all balances out when we take it for a spin later today. Expect our Co-Op Review to be up soon. Sniper Elite: Nazi Zombie Army supports four player online co-op. It is currently available for download via Steam for $14.99. For more information be sure to check out our interview the game's developer, Rebellion. Page created in 1.6391 seconds.